Prevention is better than cure. However most parasite problems sneak up on you. Occasionally, you will come across an unthrifty or unhealthy chicken. Hens and roosters look sullen, still, disinterested in life and generally out of character. There is generally less interest in grooming, sandbathing, eating which spirals down to sickness. Stop and observe; a good start is to look for body signals, tell-tale signs such as quirky behaviours, runny or sloppy droppings and so forth. Just looking at these may point to a possible illness or parasitic problem. Unfortunately a lot of symptoms may point to many different types of illness. The best approach, when your chicken is under the weather, is to isolate the bird and treat. Removing the chicken from the flock reduces stress for the individual bird/s who are experiencing lethargy and reduce the potential for cross-contamination with the flock. Treatment is a process of elimination. Parasites in poultry fall into two categories: external and internal. Good poultry management methods will assist in preventing parasite problems. All parasites will produce economic loss in poultry, both in meat and eggs, increase food consumption, and on occasions cause actual death. Usually severe infestations cause death. The most significant effect of any of the parasites is the stress it causes on the fowl. While the parasite may not itself cause clinical symptoms, the stress caused by it may well cause immune suppression and allow many other diseases which have far greater long term consequences. A medium burden of worms which may not itself cause an apparent problem with the fowls, but may cause a substantial reduction in hatchability. Any fowl effected by parasites should be treated with anti stress vitamin therapy in order to increase immune response to complicating diseases. So how do we decide that parasites are a problem? Most fowls will be found to have small levels of parasites in their systems, with no apparent effect. The interaction of the genetics, the immune system and other disease may cause a minor parasite burden in one variety to become clinical disease in another. Overall, this means that correct management, and routine properly selected treatment, is the best way to ensure parasites remain at levels below those which will trigger clinical disease. A breeding bird needs to be in the peak of health. Parasites both internal and external are using bird resources for their own ends, reducing the nutrient availability for the eggs, and so for the new generation. It is common with breeder birds to be on premises where poultry are kept in large numbers, and for longer periods. Therefore it is more likely that parasite levels may be higher. External parasites can sometimes be problematic as some of them, Stickfast Flea, and Red Mite can be difficult to handle. 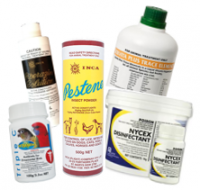 It is usual to use a Pyrethroid spray (Pestene powder for general external) and some of the newer mechanical products (Absorbacide for red mite). It has become common to use products that are not registered for poultry use. The mectin family are not registered for this use i.e. ivermection, and though many people use them, these is a problem with residues in the flesh and eggs for long periods after use. In addition, there is anecdotal evidence that they cause infertility in poultry (and infertility in people? is untested). The ‘mectins are not scheduled for use on poultry. If you are using the ‘mectins for poultry parasites, then do not eat their eggs or meat, and do not give their food products to people especially those with fertility issues, pregnant women or to children as the effects (short and long term) are unknown. In recent times, the number of products available has declined as the older less safe products have become deregistered. Using domestic fly sprays directly on birds is not recommended as several of the common sprays can cause extreme stress on the birds and even death. At the same time, several new organic products have become available which are more about sustainable reduction of challenge rather than treatment, but suited to long term larger scale operations. The internal parasites are more likely to be different types of worms in a layer flock, and so a worming treatment should be broad enough to include Hairworm (requires Levamisole) and Tape worm (requires Praxiquantal or Merbendazole). Worms are parasites, which are a group of creatures which cannot live on their own but rely on a relationship with another group of animals. There are really two groups of creatures which have this type of relationship. The first group contribute something to the well being of the host, and are beneficial organisms. The other group contribute little or nothing to the host but take away a great deal from them. If these organisms, known as parasites, are not controlled then the health of the host suffers, their reproductive capability can be curtailed, and ultimately the host dies, often because another disease now has access to the host. Diseases such as bacterial and viral infections are not usually considered as parasites because they cannot be tolerated in the host without some observable symptoms. Parasites in small numbers rarely cause any symptoms, only as they multiply and get out of control do they cause problems. For this reason, many parasites can be successfully controlled by management processes. Careful management and medication go hand in hand. Medication without preventative management is a waste of money and effort. Careful management may still require some medications to keep the host species, in this case bird species, in optimum health. Roundworm is spread by ingesting infected faeces. Roundworms present in small intestine are 5 to 8 cm long. Large roundworms occur when litter or runs have been used for many years. Hairworm, Tapeworm and Gape worm are less common in poultry although possible and are generally treated with Avitrol tablets. Only use on show or non-food producing birds. Birds often do not like the bitter taste of many medications. Addition of some sugar in the form of dextrose or castor sugar disguises the bitter taste. 1/2 cup of castor sugar in 20 litres is usually adequate. Avitrol contains Levamisole and Praxiquantil. Avitrol is suitable for use with birds not for human consumption and not producing eggs for human consumption. It is at present the only medication which removes tape worm. It is a broad spectrum wormer, which treats most worms. Dose is one tablet per bantam, 2 tablets for large birds. Repeat 6 monthly or if worms are suspected. Avitrol comes 100 tablets per bottle. Avitrol can be effectively used as a diagnostic tool, to determine the level of worm burden being carried by sample birds. Isolate a suspect bird in a cage with a wire floor. Under the floor place a sheet of cardboard, or heavy paper. Treat the bird with a full dose of Avitrol, that is 1 tablet for a bantam, 2 tablets for a medium fowls, 3 tablets for a very large fowl. By next morning the droppings of the bird should contain any worms the fowl was carrying. 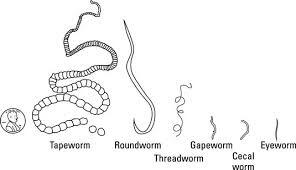 Flat segmented worms are tape worm, round smooth worms are round worm. Remember some worms are very small only 1-2mm long. These worms are made easy to see by placing the droppings into a long test tube with a filter screen halfway down. The small worms can be seen wiggling through the screen. If no worms are detected in the droppings, then treatment of the whole flock is not likely to be required. However more than 2-3 round worms and any tape worm requires whole flock treatment. If tape worms are found repeat treatment after 14 days may be required. Used for treatment of large round worm (Ascaridia), Caecal worm (Heterakis), and Hair worm (Capillaria) in chickens, turkeys, pigeons, etc. Requires only one dose. Usual Use Rate 40 grams concentrate per 1000 birds, mixed in 6 litres water. Withholding is nil for egg layers, do not use later than 7 days before slaughter. Levamisole 100gm or 500gm. For use with Poultry and Pigs. Used for the treatment of large round worm in chickens and turkeys. To be effective Piperazine should be administered twice 21 days apart. Piperazine has no with holding period so it can be used while the birds are in lay and immediately before slaughter. Usual use rate Powder 1 gram per kg body weight in 8 hours water. Liquid 10 ml per litre per 8 birds. Piperazine comes in two forms: 250ml, 500ml liquid and bulk 1kg pack. Molodri is a blend of fresh water Diatomaceous earth and Molasses. It has been used for many years as a conditioner for racehorses, and in recent times was trialled with specialty sheep. In those trials, faecal parasite counts were taken as one of the experimental parameters for the trials. It was noticed that the coccidiosis and worm egg counts were greatly reduced in the animals fed Molodri. The trials were then conducted with chickens with the same results. This is not a treatment, but as a part of a prevention program. Inclusion of Molodri in the diet at 1-2 grams per kg of feed reduces the excretion of coccidiosis eggs, reducing the level in the environment, thus reducing, over time the total coccidiosis challenge to the birds. Another method of use has been free choice, where the Molodri is in a small container and the birds can eat what they require. Actual consumption proves to be highly variable, as the birds seem to require more at different times. If you are at the end of your tether with worm problems or you are not quite sure try the worm diagnostic kit. The first things most likely to kill chicks are lack of or too much heat in the brooder, no water, or poor feed. All the above will kill chicks in the first week, when not much else will. A lot of people worry about vaccination, but in reality it is difficult and expensive to vaccinate small flocks. Different for larger operators with hundreds of chicks. However the next most likely problem tends to show itself in the period around 6 – 12 weeks of age. All poultry are effected by a gut parasite called coccidiosis (eimeria), sometimes called coxy or cocci (pronounced cocsi). This little protozoan parasite is sort of like dysentery in humans, it gives them the runs. Most people don’t see this disease until it gets to the stage the chicks have what we call “sick chick look”. The chicks stand huddled with eyes half closed, and at that stage a careful look shows they have stained backsides from runny droppings. The trouble is by this stage, it’s too late. The key to this disease is seeing it when it starts, when the droppings first become loose and soft. At this stage there is no long term harm to the chicks, but when it is left until the sick chick look and streaky blood in the droppings, the chick has its gut compromised. It may never recover the gut capacity. So the key is observation. At the first sign of loose or runny droppings in any of the chicks, start a treatment program. This disease is simple to control, and mostly it gets out of control by misunderstood management. This becomes apparent usually in the 6-12 week period, and the usual cause goes like this. There is a product put into chick feed, called a coccidiostat. It is intended to protect the chick until its immune system can identify and cope with the eimeria parasite. The medication in the feed has 2 levels, starter feed and grower feed. The starter feed has a high level of preventative in it so that any infection in the first 6 weeks is suppressed to almost nothing and the little infection that may be present is unlikely to overwhelm the immune system of the chick. The grower feed is designed to allow some infection but much lower than what would affect the now maturing immune system. That infection is needed to allow the lifetime development of the immune system. The problem starts because this critical period tends to coincide with several other events. Usually people tend to take the birds off heat between 4 and 6 weeks, and this often adds a little stress to the birds. The birds at this time are changed from starter to grower food, and if this is done abruptly the chicks often don’t take well to the diet change and so slow up in their eating. This reduces the amount of preventative they are eating also. Then the birds are also often fed grass and other foods which further dilute the food and with it the level of medication. In addition there is usually the increased ingestion of the coccidiosis eggs which will be in the environment if chickens have been kept there before. Altogether this means the level of medication is low and the immune system is reduced by the stress. The result is the coccidiosis gets the upper hand. Part 1 Careful attention to management, heat to reduce stress, diet to make sure medication levels are correct and reduction of challenge from coccidiosis organisms in the soil. Part 2 is careful observation. It is important to treat early when the first symptoms arise. Even the best management will still sometimes require extra management by way of medication. Part 3 is Medication. There are now only 2 medications which are suited to home use. These are Amprolium and Baycox. Baycox is a great medication, and works well, but we still regard it as the drug of last resort, it works when nothing else will. But we do not want to build resistance to this drug so we try to limit its use. It also only comes in 1 litre bottle for some hundreds of dollars so it’s very expensive. Other drugs used have now become vets script only. Amprolium is a derivative of thiamine and so is very safe, and works by causing the coccidiosis to starve. In order to do this the medication works best used continuously for 5-7 days. Often in bad cases we will use a high dose for 5 days then a half dose for another 5 days. But the key to success is continuous treatment, started early. By the time the birds are 12 weeks of age, if reared on the floor, they will be immune to coccidiosis. Amprolium is a prevention treatment and curative. Coccidiosis vaccines are now available, administered at day old. The consist of drops in the eyes of the day old chicks so they get very weak strains of coxy early, and the immune system can recognise the parasite without being overwhelmed by it. The weak strains are very easily killed by both the bird’s immune system and any medication we might want to use. This technique suits those who want to use undedicated feed and who have enough chicks to justify the vaccine price. For breeders who have a relatively small property, one problem which starts to arise if the build-up of coxy eggs in the soil. With the right conditions the coxy eggs live longer than 1 year meaning the new birds are producing coxy eggs which add to the previous generation. Even when the birds are immune to coxy, they still shed some eggs. This means with time the level of challenge increases, and the higher the level of challenge the harder for the bird’s own immune system to control. More recently Molodri, one of the organic products, has come onto the market reduces the level of coxy eggs excreted by the birds, and over time reduces the level of challenge to the birds. Molodri also reduces the shedding of worm eggs as well. The most common poultry parasite is the common louse, otherwise known as “chook lice”. They are relatively benign, and simply cause a mild irritation to the birds. Occasional use especially before summer, of a dusting powder or lice spray is all that is needed to control lice. Pestene is a natural Derris dust and will control not only lice but most of the less common parasites which may effect small flocks. In extreme cases of lice, or where other treatments don’t seem to have effect, turn to diatomaceous earth for ongoing treatment. Mites generally show up in poultry as red mites or leg mites. Red mites may appear as small black, mobile dots on perches, in nesting boxes and on the hens themselves. If handling hens, your hands will have tiny mites causing itchiness and irritation. Extended exposure to red mite will result in hens becoming anaemic, lethargic and with reduced immunity. Leg mites present as misshapen, messy looking scales on the legs or eventual lameness. Generally you wont see this mite as it is hidden deep under leg scales. Products such as Avian Insect Liquidator (AIL) will act on immature and mature mites. Diatomateous Earth (DE or Absorbacide) will act well where you feel overwhelmed by the mite problem.